The largest television network and one of the largest cable distributors announced a merge last week, solidifying a grim future for opponents of media consolidation. The United States government and the Federal Communications Commission approved the NBC Universal-Comcast merge last Tuesday, and it be official by the end of the month, the New York Times reported. â€œThis is a proud and exciting day for Comcast,â€ said Brian L. Roberts, Chairman and Chief Executive Officer of Comcast in a press release last week. â€œThe NBC Universal joint venture will be well positioned to compete, innovate, and bring new choices to consumers,â€ Roberts said. Opponents of media consolidation think otherwise. â€œThe FCC has opened Pandoraâ€™s Box, and we can soon expect a whole new swarm of mega-mergers that will have dire consequences for media and the Internet,â€ said Josh Silver, CEO of Free Press, an organization that promotes media reform. â€œToday, Comcast has won the jackpot, and once again, it is the American people who will end up paying out,â€ Silver said. Comcast will now control a large number of media outlets, including all of NBC, dozens of cable channels, movie studios and the actual network that distributes content to millions of Americans. Silver said that the merge will allow Comcast to raise the prices that other cable companies and distributers pay for NBC content, in turn causing higher prices for consumers. Silver also warns that this merge will open the field for other mergers, meaning more consolidation, and more negative consequences for consumers. Silver says that the FCC, when approving this deal, ignored the current lack of competition in the Internet service provider market today. Silver also says that media mergers like this are a symbol for larger problems to come in our society. Free Press criticized President Obama, who previously opposed media consolidation when campaigning in 2008.
â€œI strongly favor diversity of ownership of outlets and protection against the excessive concentration of power in the hands of any one corporation, interest or small group. I strongly believe that all citizens should be able to receive information from the broadest range of sources,â€ Obama said. Obama criticized Bush-era consolidation and vowed to fight against it during his presidency. 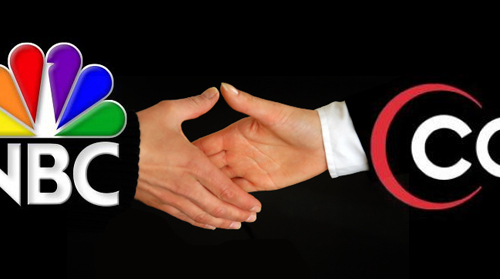 A Comcast press release said that the merge transaction would generate $8 billion dollars for them just at signing. Prior to merging, Comcast already controls United States media in the form of 22.9 million video customers and 16.7 million high-speed Internet customers. â€œYou should be afraid and mad as hell,â€ Silver said.